Interesting Centauri Dreams article postulating about civilizations. We are separated from our fellow civilizations not just by vast distances in space but vast amounts of time. The nearest civilization to us that existed could have happened hundreds of millions of years ago or hundreds of millions of years in the future. If they exist today they would likely be much more advanced. The author then continues to discuss energy requirements for a civilization. He deems it unlikely that a civvy confined to one planet could develop interstellar travels due to energy need. He proposes that a civilization could spread throughout it's star system eventually inhabiting the trillions of potential bodies in an Oort cloud. If Earth continues its current growth in energy consumption, we will overheat our planet through our waste heat alone in the next century, never mind global warming through CO2 emissions. So, it looks as if we remain confined to our planet, we will probably never have the ability to send out interstellar colony ships. There is, however, a way to have our civilization reach enormous energy levels while still within our solar system. Our solar system may have as many as a trillion comets and KBOs orbiting it, ten times the mass of the Earth, all nicely broken up. (There may be more comets in our solar system than there are stars in our galaxy.) And as this is the bulk of the easily accessible material, it would be logical to assume that eventually this is where the bulk of our civilization will finish up. A hydrogen-fusion powered civilization could spread throughout our cometary belt, and with no grand engineering schemes such as the construction of a Dyson sphere, it could, through the cumulative growth of small, individual colonies, eventually build up a civilization of immense power and size. For example, if each of a 100 billion comets were colonized with a colony that used 1000 MW of power (a small city’s worth) then the total civilizational power consumption would be in the order of 1020 Watt. Pushing it a bit, if there was a 20,000 MW colony on each of the 5 trillion comets in the Oort cloud and the postulated Hills cloud, then the total civilizational power consumption would be 1023 Watt, that of a red dwarf star. For this society, interstellar colonization would be but another step. The rest of the article discusses the time span a civilization could exist and what would bring about its demise, from catastrophe to dispersion. 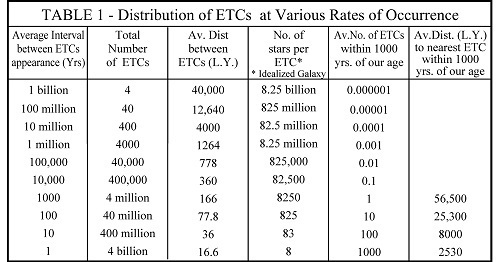 This is a table depicting the spread of civilizations in an idealized galaxy, ie stars spread out in a common density. The parameters go from a civvy a few lighteyars from us to us being the only one in the galaxy. I think the latter is more likely. The nearest civilization in mu humble opinion is a 10,000+ ly away and perhaps existed in some other era.